If you are going alone, you don’t need a jet ski with three seats as it will cost you more. At the same time, if you have one or more riders, you want to pick a jet ski whose seat size will fit everybody. 2. Is there a deposit requirement? There are jet ski rentals in Myrtle Beach that ask for a deposit, also known as a hold. This covers them in case there are any damages on the jet ski upon its return. You also need to know whether or not gas is part of the rental charge. Do you get the jet ski filled with gas when you take it or do you pay for it to be filled? In order to be clear on this, make sure that you pose the question before renting a jet ski. Once everything is clarified, it is time to pay for your jet ski and let the fun begin. 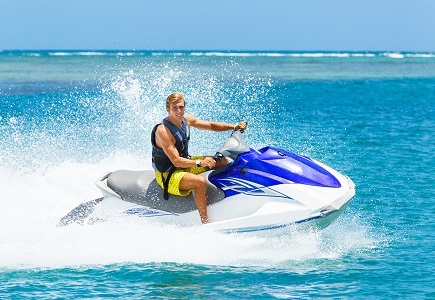 At Action Water Sportz, we have very flexible terms when it comes to jet ski rental arrangements. There are also different jet skis in top condition for your jet skiing pleasure. We are your best bet for a fun-filled jet skiing outing for you and your loved ones. Vacationers are considered to be a soft target and are always vulnerable to scammers and opportunists. This is especially prevalent in foreign countries where there may be a language barrier. Anyone can be a fall victim to a scam. The thing about scams is that there is really nothing sophisticated about them. They are easy to avoid as long as one stays alert. It’s also important to know what to look for and what to avoid. Scams involving jet ski rentals are very common. In fact, there are a number of YouTube videos that show how they work. People on vacation tend to think that the only scam involving jet skis is being overcharged. This is not the case in most cases. The real scam does not happen when you go to pick your rental jet ski but when you return it. That is when you will be accused of damaging it. There are two common claims that they make. They will say that either you hit another jet ski or some rocks while you were in the water and demand that you pay for the damage. The easiest way to avoid being the victim of a scam is to deal only with reputable jet ski rental companies like Action Water Sportz. Such companies have reputations to protect and they always try to avoid controversy. At the same time, it is very important to look for any physical damage on the jet ski before renting it. If you have to take some photos, do it. This will save you your hard earned money and the bullying tactics of some of these aggressive con artists. Action Water Sportz has been serving the Myrtle Beach area for years and we are here to ensure you have a great experience. We purchase new jet skis every year for our customer’s enjoyment. Give us a call today to reserve the time of your life. Copyright © 2019 Action Water Sportz | Jet Ski Rentals Myrtle Beach. All rights reserved.